Ahh! Summer in Colorado! 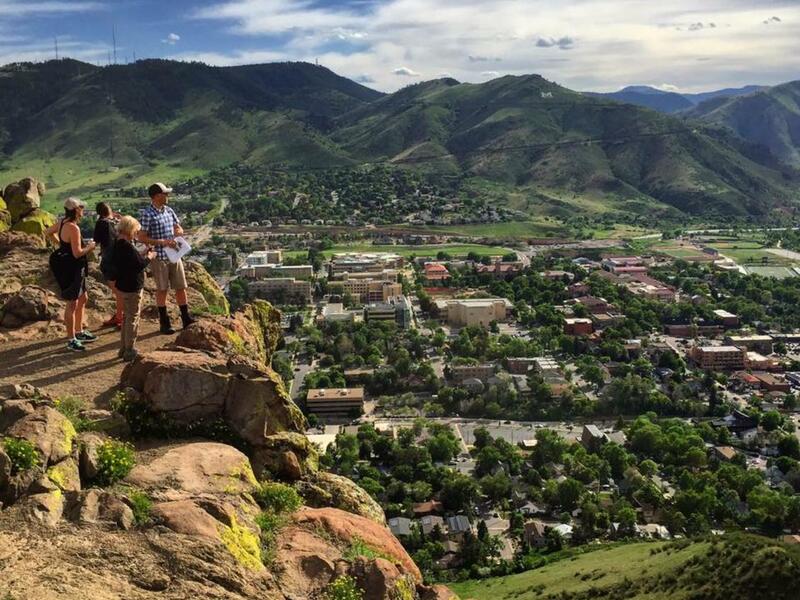 Concerts at Red Rocks, craft beer on sunny patios, hikes in the glorious mountains and….out-of-state friends and family clamoring to visit! Do you have friends and family visiting this summer? Here are nine reasons to bring them to Golden to easily experience the best of Colorado. 1. A Mountain Experience Without the Altitude – or the Attitude. Golden offers everything a mountain town should: gorgeous mountain views in all directions; a river with kayaking and rafting flowing through the center of town; miles and miles of hiking and biking trails; historic buildings from Colorado’s gold rush days; a half dozen breweries with outdoor beer gardens and food trucks and a flower-lined main street filled with outdoor recreation stores, galleries and one-of-a-kind shops. The BIG difference is, Golden is only 5,675 feet high! So instead of watching your flatlander friends huff and puff and complain about the altitude, head to Golden where they can enjoy the feel of a mountain town without the extreme altitude gain. 2. No Buzz-killing Traffic Jams. Nothing ruins a day in the mountains more than being stuck in a traffic jam. 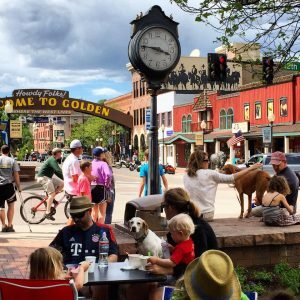 The beauty of Golden is that is served by three highways and is only 12 miles from downtown Denver – no more than a 20-30 minute drive from most places in Metro Denver, yet a world away in atmosphere and ambiance. 3. Thrill Your Flatlander Relatives with a Quintessential Mountain Road. 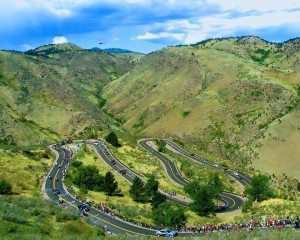 The drive up the Lariat Loop Trail from downtown Golden to the top of Lookout Mountain is pure Colorado – hairpin turns, deadly-looking drop-offs, cliffs, and a disturbing absence of guardrails. Ah, but the views! It’s no wonder this road, that gains 1,300-feet in just 4.3 miles, is one of the classic bike rides in the state, featured twice in the US Pro Challenge with the world’s best bikers. It’s also one of the state’s best scenic drives, climaxed at the 7,379-foot summit of Lookout Mountain with 360 degree views. It’s just a short walk from the free parking on top to Buffalo Bill’s grave. Don’t miss the giant gift shop – rated one of the best places for souvenirs in Colorado. 4. After that Drive, Enjoy Lunch, Beer or Distilled Beverages at an Outdoor Café. After that white-knuckled drive up Lookout Mountain, many out-of-towners feel the need for a “restorative.” And what could be better than three free beers! That’s right, free. The fascinating tour of Coors Brewery (the largest single brewing site in the world) takes you past endless copper kettles and into the dizzying chaos of the packaging plant and ends with a chance to taste three free glasses of their various beers. More of a craft beer person? No worries. There are six craft breweries in Golden, three in downtown within walking distance of Coors. There’s also two dozen restaurants. Join the locals at Woody’s Pizza or stroll down to D’Deli Sandwiches (rated by many as the best sandwiches on the Front Range). You can taste the Southwest in the gorgeous flower-covered patio of Table Mountain Inn; or watch kayakers from the riverside patio of the Golden Hotel. 5. Work Off the Calories With a Bike Ride. Don’t have enough bikes for your visiting friends? No worries! The Golden Bike Library (located conveniently in the Golden Visitor Center) has 40 bikes available for free two hour rentals, Thurs.-Sun. Pedal down the Clear Creek Bike Path, a flat, paved, off street trail that follows the beautiful river for miles up into the mountains or downstream to Denver. 6. Give Them a Galloping Goose. Colorado is famous for its narrow gauge steam railroads, but you don’t have to drive across state to see them. 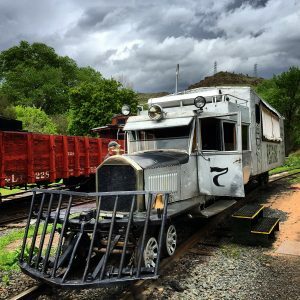 The Colorado Railroad Museum in Golden has a half mile of circular track and all summer they fire up their steam locomotives and chug around in circles, giving everyone the thrill of riding a genuine steam train. When the steam locomotives aren’t running, they have a Galloping Goose – a crazy contraption that is an antique Pierce Arrow limousine mounted on train wheels with a bus welded on the back. This train actually ran over Lizard Head Pass in Western Colorado, and it’s a hoot. The museum also has Colorado’s largest collection of locomotives and cars, a gigantic outdoor garden railroad, and an amazing indoor HO model train, complete with a circus, city and mining camp locations. 7. Show them the Old West. Golden was Colorado’s first state capitol and a one-time rip-roaring mining camp. General Grant and General Sherman once stayed in what is now the Buffalo Rose Tavern (known for its live music on the outdoor patio or on their giant indoor stage), and the state’s first capitol building is now a restaurant and bar – The Old Capitol Grille. Just two blocks away is the Clear Creek Historic Park, a re-creation of an authentic frontier homestead with a barn, chickens, farmhouse and outbuildings, all in a spectacular setting. Or spend time with the greatest Western hero of them all, Buffalo Bill Cody. Located on top of Lookout Mountain, this fun museum is devoted to Bill’s exciting life as a buffalo hunter, showman, and army scout. You can see everything from Sitting Bull’s feathered headdress to sharpshooter Annie Oakley’s rifles. 8. Get Wet! There’s no lazier way to while away a Colorado afternoon than renting a tube (available at several places in Golden) and floating down Clear Creek. A paved bike and hiking trail follows the creek, so you can walk as far as you like upriver and float downstream, passing through many man-made kayak and tubing chutes along the tree-lined creek. It’s a relaxing way to spend a hot summer day while armadas of white puffy clouds sail overhead. 9. Feast on Colorado Cuisine. 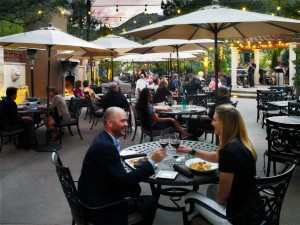 Enjoy dinner on a patio as the perfect end to your perfect day in Golden! If you’re looking for a special meal, make reservations at the Briarwood Inn, which features fine dining such as Colorado lamb and Filet Mignon. Abejas prides itself on locally sourced ingredients and organic meats. Or, you might enjoy Southwestern fare, like margaritas and street nachos at the Table Mountain Grill & Cantina. Another local favorite is Miners Saloon, which pays tribute to Golden’s mining history with its beautiful décor, wide selection of Colorado spirits and beer and modern take on 1800s entrees. After your visitors head home, we bet you’ll want to come back to Golden on your own! Check out visitgolden.com or sign up for our e-newsletter to be in the know on events and info all year long .